Learn how to increase & maintain your energetic health. Hear an inspirational channeled messages on the Power of the Moment, Gratitude & More! Includes daily exercises for your life to flow through the changes of the New Age. By Katy Simmone, host & advanced channeler of Light Beings. Use as a high vibrational meditation. The Soul Evolution Center Show to Evolve into Your Best Life! A special time where different dimensions intersect for spirituality & metaphysics. 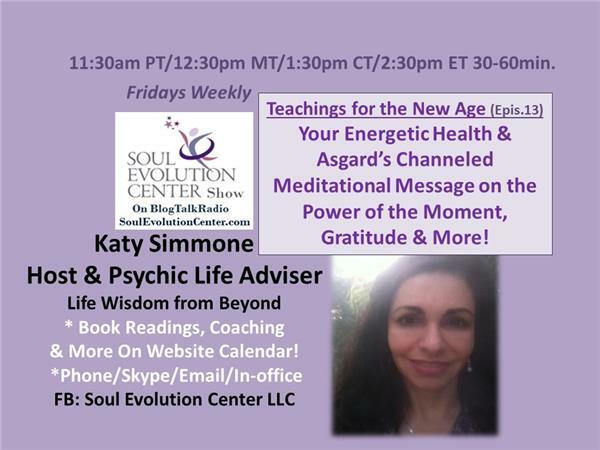 Katy also shares on her Blog,Soul Evolution Center FB page, & YouTube.